Auto dealership Peters Auto Mall, High Point, North Carolina, has partnered with Spectrio, a provider of audio and digital display solutions, to implement a convenient kiosk solution to reach area customers looking to learn more about late model used vehicles. The kiosk enable them to view photos and specifications, and to browse all the vehicles on Peters Auto Mall lot. Spectrio developed an interactive application the for digital kiosk displays located at the Peters dealership and at a local shopping mall. 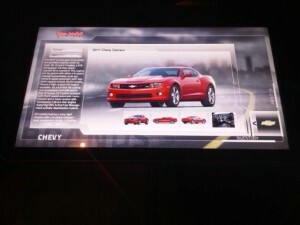 Each interactive display includes specifications and stock photos of every vehicle from the 2008 through the 2011 model year, providing a potential car buyer with information they need for vehicle comparisons. In addition to the stock photos and specifications, the kiosks also allow users to access the Peters Auto Mall website, where they can search through current vehicle inventory at the dealership. The kiosks not only receive automatic updates of subsequent model year vehicle specifications and photos, but Peters is able to request custom content changes at any time. Spectrio’s kiosks also provides access to the Peters Auto Mall Facebook page so customers can make another connection with the dealership. The sales team at Peters Auto Mall frequently uses the interactive kiosk at the dealership to access information about vehicles quickly without the need to memorize every detail about each car in stock. Overall, Peters has seen increased customer traffic to its mall kiosk and online clicks to its inventory of vehicles have notably increased, giving the company an advantage over other local car dealerships, and providing it with an additional customer service avenue. Spectrio was founded in January, 2012, from a merger between Audio Messaging Solutions (AMS) and Impressions On Hold (IOHI) to provide digital signage and kiosks. This entry was posted on Friday, April 13th, 2012 at 10:30 @479 and is filed under Scuttlebut. You can follow any responses to this entry through the RSS 2.0 feed. You can leave a response, or trackback from your own site.